Thanksgiving is getting close so I thought I'd make a recipe post. I'm in charge of some sort of sweet potato recipe. The trick is I need to transport all items on Wednesday and be able to make it start to finish with no stove or oven. Sooooo before I go off on a recipe search, anyone have one they already use? What other recipes are you looking for? I also make the peanut butter blossom cookies and saltine cracker cookies. I need to come up with something simple- side or main for Wednesday night. If anyone has a recipe for something quintessentially Thanksgiving (especially vegetables) that would go good in a gift basket and/ or be easily passed out. So far I have these pumpkin cake bars. 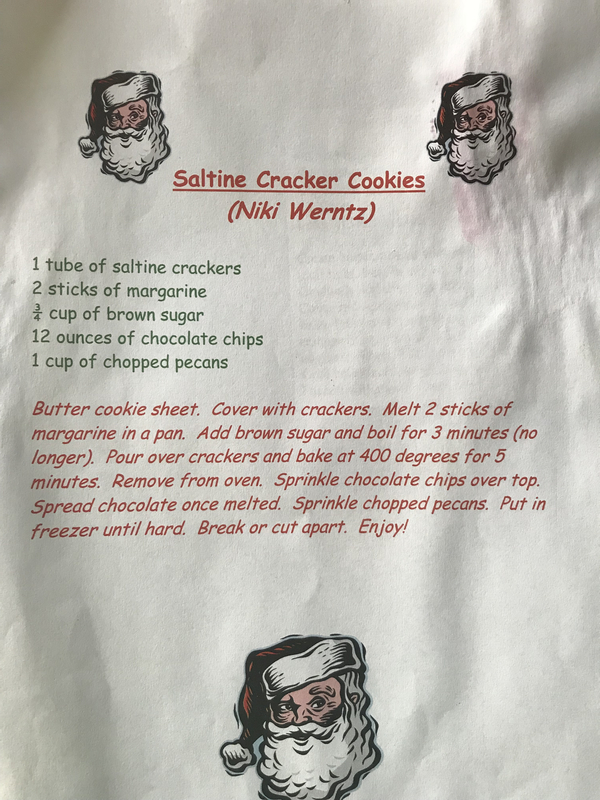 What are saltine cracker cookies? What do you mean by passed out? Like ready to eat or passed out hot? Green bean casserole is my first thought of course. My family does a green bean with bacon and vinegar. Oh and I’d forgotten about this awesome recipe. I’m going to assemble this the day before and reheat in the crockpot day of. @6fsn- like handed out. Since I can’t invite all the people over for Thanksgiving this year, I would like to bring some of it to them by doing small samples of traditional dishes (they are all non- Americans). I found Stuffing Muffins that I think will do well. thanks for this! This looks really easy to do! I'm kinda fearful of a whole stick of butter (I know I wont be eating a whole stick in one serving) - any substitutions? I just had a picture in my mind of Paula Deen saying with her slow, Southern drawl, "Then add a whole stick of butter." Alex Guarnaschelli, of Chopped fame, owns a restaurant in NYC that is simply named "Butter". One of these days, I will go. But what am I talking about. I can't even keep up with all the great places to eat in my own city. How can I possibly get to all the restaurants I want to try on my occasional visits to NYC, lol? Just means you have to go back! Paula Deen. That's who I was thinking of! Couldn't remember her name. As it turns out, no one in my family likes sweet potatoes (who ARE these people!!!) so I'll buy one for me and cook it with their regular old boring potatoes. Ya know, I'm not a big fan of sweet potatoes either. I don't dislike them. I'll have a small portion if they're around. But I don't go out of my way to eat them. So I don't make sweet potato dishes myself or order them in restaurants. Hence why I can't help @6fsn with her sweet potato dilemma, lol. I don't like sweet, sweet potatoes- like with marshmallows or streusel topping or brown sugar. I like this recipe because of the savory. If I do a simple mash I add greek yogurt and parm cheese. If I do rounds I sprinkle them with steak seasoning. @missjeanlouise- what about just small portions of green bean casserole or bacon wrapped green beans? I was also thinking you could do a cranberry nut bread, but it might be too close to the pumpkin bars. @missJeanLouise I've been making these pumpkin muffins for years. It's now a staple of our family t-giving breakfast, but also doubles for dessert. They're so good. Sorry, going in kinda blind on this one, trying this week. @mobkaz, those sound delicious. I'll be trying those. We love sweet potatoes as does DD. I'll share those recipes with her when I am in Chicago this week. With my typical sweet potato recipe, I used to add this topping the last 15 minutes and it was incredible. Obviously it needs to bake in the oven. ETA.....enjoy those babies! Hope everyone is doing well! Could easily reheat in a crockpot/microwave: bacon wrapped stuffing bites. Make Stovetop (or other packaged stuffing mix … or make you own) and roll prepared stuffing into small balls. Wrap each ball with half a slice of bacon and secure with toothpick. Bake in the oven until bacon is mostly crispy. @MobKaz, yes that's the kind of topping I usually put on my sweet potatoes but I'm always looking for healthier less caloric options. And thanks, everyone is doing well - the boys are growing so fast. My car practically can drive itself between Indy and Chicago these days! Hope your family is doing well too. Sorry to hear you've had such a stressful year. Will you get to see your little grand daughter during the holidays? @ernursej those sound so yummy! Of course anything wrapped in bacon sounds good. @ILoveBeachMusic, whether by necessity or desire, we have also scaled back quite a bit on "heavy" calories. I do long for those "devil-may-care" days when my metabolism and digestive system could handle rich foods once in a while! DD is on a ZERO processed food diet, as well as several other restrictions, so we are back to our "pioneer days" of cooking. But it is helping and we are starting to see some semblance of a new normal, so all is good. We head out to see LO#3 the day after Christmas for some sunny Christmas cheer. I love winter, but this early snow and cold snap has been a tad too much too soon! I've been trying to update my avatar picture but can not for the life of me remember how I did it. I am on year 3 of my "snow globe tradition". The local kiddos already busted out the Christmas decor (a HUGE no-no at my house, since I host Thanksgiving) and they went right for last year's globes. Just picked up the new ones today, but they will have to wait until St. Nick night to get those! How adorable and what a great tradition! I'm looking forward to starting new traditions for my little ones. Right now I'm rushing to finish the second Christmas stocking! Hopefully it will be done by Thanksgiving or shortly after! I arrived just in time for the cold snap. This is the first time I've been here and am not going out for my daily walks but I can't bear to walk in 30 degree weather! What a terrific picture @MobKaz! 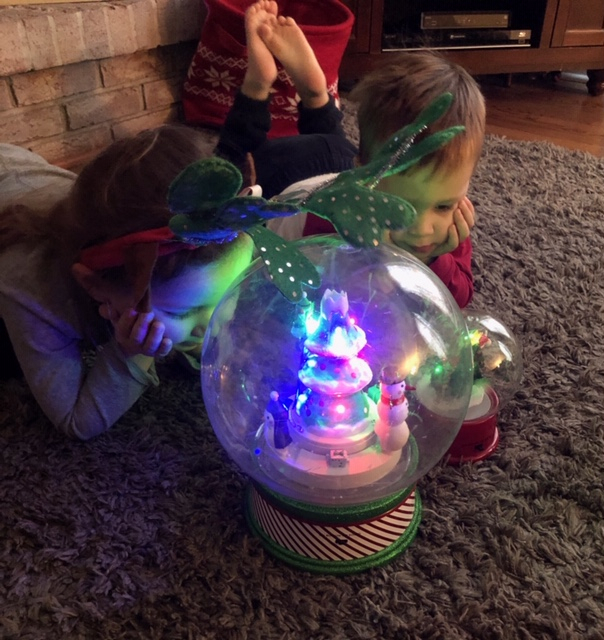 Really captures the magic of Christmas! You and @ILoveBeachMusic have some lucky grands! @ILoveBeachMusic, I made the crock pot sweet potatoes and they came out AMAZING!! I was a little nervous as there was so little liquid in the recipe, but then realized the apples would break down to soften the potatoes. I did not include the brown sugar, as that is another "no" for DD, and they were still crazy sweet! This will be the new go-to for sure! Anything that I cook outside of the oven is a huge win! I hope your dinner was successful and that your time with those babies was sweet! We are still up here but are leaving tomorrow! I can't get enough of those sweet little guys. I hope you had a wonderful time with your little ones. Glad to know that the sweet potatoes were so good. I will try them for Christmas since I wasn't in charge of the Thanksgiving menu.